In this article we will develop an Android Application which displays a set of nearby places of current location in Google Map according to the type entered in the Spinner widget. 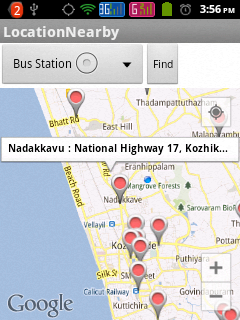 This application makes use of Google services like Google Map Android API V2 and Google Places API. 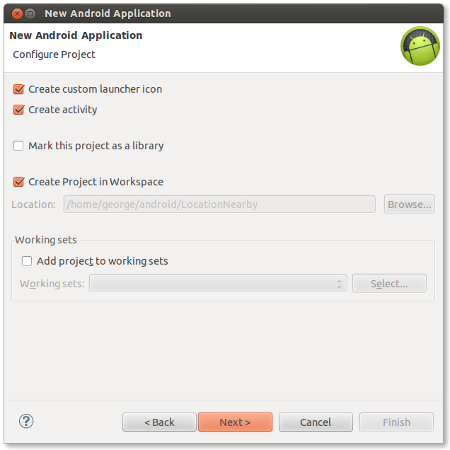 This application is developed in Eclipse (4.2.1) with ADT plugin (21.0.0) and Android SDK (21.0.0) and tested in a real device with Android 2.3.6 ( GingerBread ). We can create API key for Google Place API by clicking “Create new Browser key” available at the “API Access” pane of the Google console URL : http://code.google.com/apis/console. Also ensure that, “Places API” is enabled in the “Services” pane of the Google console. Note : Defining string arrays to populate Spinner Widget with Place types. Note : This class parses the Google Places in JSON format and returns a List object. // Setting the title for the marker. Note : At line 128, replace “YOUR_API_KEY” with the api key obtained in Step 9. Note : At line 43, replace “YOUR_API_KEY” with the api key obtained in step 8. THANK YOU SOOOOOOOOOOOOOOOOOOOOOOOOOOOOOOOOOOOOOOO MUCH!!! I WAS TRUING TO DO THAT IN WEEKS!!!! IT’S WORKING PERFECTLY!!! i am trying to do that in android 6.0 but its not working .pls help me. can you tell me what to do if i want to show a fixed area in my app not all the world when i entered into that fragment.. I m not sure this is working o nt…. when i go to this link maps.googleapis.com/maps/api/place/nearbysearch/json? sir i wud lyk to know..why is it shwing request denied? this link is not working: maps.googleapis.com/maps/api/place/nearbysearch/json? You must use your own API key (for browser apps and for android apps). It works great! Sir I insert my own key in to that code but when i run this the simulator shows message that “unfortunately application has stopped” . Hi,did you fixed it,please write. Would u please tell me How much will i be charged for google places api key…..????? Thank U So much Sir…!! Nothing it’s free. You are welcome! Please ensure that, you created a “Browser key” from Google API console and you enabled “Places API” in “Services” menu. it does not show any marker. plz plz. help me . THANK YOU SOOO MUCH FOR THIS !!!!!! I’ve been Googling a SIMPLE answer to solve this ALL day, WHY can’t people write up something as simple as this. You’ve definitely helped me a lot, thanks! i just need to show nearby restaurants on map…using google places api. how can i do that? This tutorial is just too Good.Thanks a lot.It saved my time.Can you also tell me how can I show the route to this nearest places selected with the distance specified,so that the users could choose the nearest place ? Did you achieve to draw the route to these places? I’m strugglin a bit with that. For some reason I am not getting any of the markers showing up when i press FIND. Please mr Luis.. help how you solve to show marker??? how did u solve this problem sir. when i press find nothing happens. I am also not getting any of the markers. I am using the correct API key….any ideas??? Hi,George .. This is great Stuff ..Thank you very much . Yes,Sorry for Disturbing I added API key from “Key for Android apps (with certificates)” Instead of “Key for browser apps (with referers)” Now It works great .Thank you very very much george! For this great tutorial . Hi, I followed the whole tutorial which is really helpful. But when i deploy it on the emulator, it says “you need google play services”. Can you suggest what can be the reason for not detecting the google API. 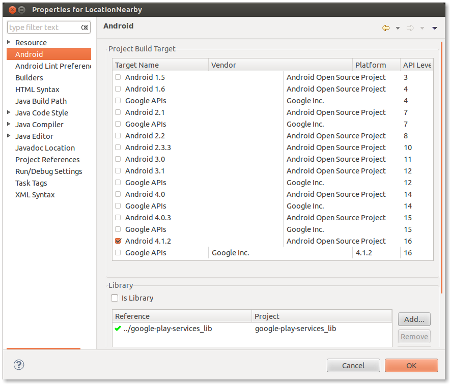 1. placed the google-play-services_lib in my workspace. 2. Included it in my project library. i just realized that the google play services dont work on emulator..tried it on my android phone! and its working.!! thank u so much! your code rocks…. Millions of thanks to you George! Your tutorial is up-to-date, cover the right scope (not too complicated, not too simple task) and it explains the 2 different keys needed for Google Maps Android API and Places API (my chief confusion last few days). can you show me the example how you put the marker in? i am a student and is quite new to these things many thanks. this tutorial is good man real good but 1 problem is i till now still cant figure how to add marker into it can any 1 please show me an example on how to do it please. I am not understanding your real problem. How can I improve with your code? So, I want to know the proper format to write ‘atm,bank’. This comma thing ‘,’ is wrong. activity_main cannot be resolved. Please help me. It shows maps and current location. But on clicking the find button it shows nothing. I tried changing the radius also. But my problem is not solved. What changes have you done to the code>? Sir it also give me error on following line in layout.xml file. Are you getting any hint on error message in Logcat? VERY Good tutorial but i don’t know why there is no markers :/ is there some solutions ??? Thank you for your good tutorial,But i splitted your MainActivity.java into two first class download the data and second class show the map and markers so i need to send the list value to the next intent what should i do now? Thanks for such a nice tutorial. I need to ask one thing why places are not appearing in my map, it is only showing my location, even FIND is not doing anything. NEED HELP. As soon as possible. i see 2 keys created 1 for android app and another 1 for browser key (i made places API on in services) does this key used for places? and where i should put it in my Application ? in replacement of Google maps key or what ? Browser API Key : This is the key obtained in step 9 and use it in the line 128 of the class MainActivity. Thanks very much, this solved the problemm, actually we are working together but i have another question please how can i show the places in a list ? what i want to do is show places in a list then if i pressed on any item it will draw a route from my current location to this place? my project is showing current location on map but when i click any place type in spinner e.g banks it does not show any results, plz tell me how can I solve the issue????? I check two key several times …. Please ensure that, “Places API” is enabled in the “Services” pane of the Google console. Print the value of the StringBuffer variable sb of MainActivity class in Logcat to get the url and enter it in a web browser to see any places return? Now I want to display the route when I select a location. please help me this is really urgent it is for my final project study. Hi, first thank you for this helpful tutorial, second, my maps is working fine so I assume that the Google Maps Android API is working perfectly, though I don’t think the place is working in my maps, I obtained it for the google api’s consol website by clicking on “Generate new browser key..” and I’ve put in in line 128 as you showed in the tutorial, still not working. Is it because that I should specify a name for a website when I click generate new browser key or what? and if yes what URL should I enter? On generating browser key, we can keep the url referer field as blank. Thank you so much man, such an amazing tutorial, it’s working perfectly now. I have a question, how the map know the places I input in the strings file? Because I’m trying to give it a name of a shop for example “Walmart” it’s not showing in the map? Hi George. First of all thank you for this tutorial. I have a problem please help me. I can see my location (it works) but i dont get any reaction when i touch find button. I have been try to fix this problem for a long time. Its my senior project. Please help me. Thank you. I want to display the route when I select a location. Would you please tell how to show the details of those places nearby? can u explain to me the part of on post execute when i return the hashmap in list and then get the values in hash map i can’t understand this exactly and how can i put latlng only in list? “list” is an ArrayList of HashMap objects where each HashMap object represents a place with keys, place_name, vicinity, lat and lng. So “list” contains all the nearby places. This array list is created in the class PlaceJSONParser. Hi george;I dont get the markers on the map.What the reason of this problem.everything is allright,I dont get error but only the markers is not visible.So important for me please help.thanks for everythng. Hi george .. how to display the nearest location by using its own database? Hi man, I really appreciate your work. i just need to show nearby mosque on map…using google places api. how can i do that? I need to ask one thing why places are not appearing in my map, it is only showing my location, FIND is generating this error. Figured out my problem Places API was not enabled. HELP! Application force closed! Error is at ParserTask.onPostExecute(). hey Ashwini, i already solved the problem. NullPointerException at onPostExecute indicates that your app didn’t retrieve any data from Google database via Google Places API. Hmm..i think you have to double check your Places API’s configuration. You should create a new Browser key instead of a new Android key from Google APIs Console. And I realized that when you are creating an either Android key or Browser key, you should just click on create button without keying any certificate fingerprints or package, so that the key generated can be used by any apps. i am getting this king of errors..can you please help me?????? Thank you so much for this tutorial. It’s been incredibly helpfull to me! I am wondering if you could help me with a modification of this code. I have done some other of your tutorials, and now I would like to display the Places of interest along a selected route from one point to another. I don’t know how to make the query in this case. I think the given below article will do for you. Hi george i download your code run in my device it running fine but when i choose the place like atm,bank nothing will be displayed can you help me to solve this. Please print the downloaded data ( before parsing ) in logcat to check whether it contains any place or not for atm, bank etc. It shows like the following. Thank you george it worked fine . Really nice tut and simple to understand. thanks sir,I am new programer in android field and your examples really help a lot. hi vignesh. i also have this same problem. did u solve yours? please tell me how if u did. thanking you. Sweet..the code that I’m looking for..easy to follow and replicate..much appreciated..
thanks for such a nice tutorial. it was helpful. Can I know how do you fix the problem please. Thanks. How to manage exception when no internet connection. so when i click Find Button apps wont crash because of no connection. Hello,this working very well.thanks for this tutorial. How can i had my own marker for showing places instead of default markers? 1.How to a polyline from current location to nearest marker ? 2.How to draw a polyline from my current location to touched marker using on marker click listener ? when i try click on find button on the emulator, nothing happens. I Enter correct API Keys and on Places API,but nothing happens..
hello sir, when i run the code nothing is diplaying on the screen, no map and no location.please help me as soon as possible as i m developing some live application. hello sir , please help me as nothing is displaying on the screen. I want to show the near tourist locations.how to add the place name of that..please reply me..
for ex:if am in mysore ,it should mark on palace,K.R.S,etc..
Just copy the code and put my own keys, do I need to consider anything else? I double check my Both API(Maps API and Place API) and placed at there proper place(in Menifest and MainActivtiy), I have tried also new created keys. 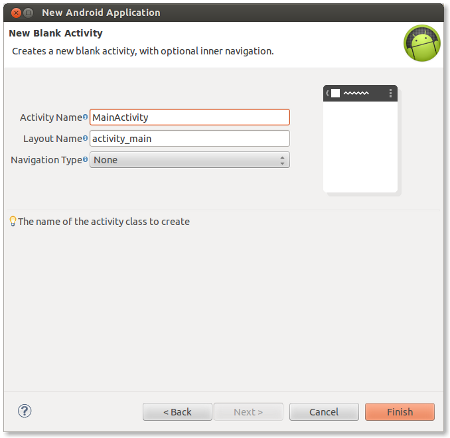 I downloaded your code and run with virtual device which run android 4.2 api17 with google api and no google api and it crashes where did I go wrong? could you tell me ? Please give me some solution. 2 things need your help Sir. I got the Google play services installed. It should not be related to the keys right? any idea how I can fix it? Hi, thank you .. working! Thank you so so much bro, That helps me for my midterm project. Sir,I am not getting result on find button click,and getting resource not found while debugging.. I have but one problem, how do i get browser key api as you said in step 9. My project is perfectly running now but it doesnt show any places because i had to use android api key (which is stupid of course ) . I tried to find this file in the SDK Manager, Extras, but I couldn’t. Hello sir, if i want a particular location to show as the default map when lauched how can i do that sir? Sir, i have used the source code in my project. I am getting the eror due to unable to start Activity :android.content.res.ResourceNOTFOUND Exception: String array resourceId. Can you Please tell why i am getting this error? Hi Mr.Mathew, thnx for the tutorial. My question is that the above code returns only 20 results maximum and rest are ported to other pages of response. So how to read and display all the locations by reading all pages?? Hello Sir, Can u please tell me how to get the nearest police station phone number using google api, currently I m using place api it was returning the details about nearest police station, but phone number is still missing. Help me to sort this problem. sir hi,firstly thanks this tutorial ı run this but later when ı select item frpm spinner I get sendUserActionEvent mView== null error. do you know why? I replace my own Keys with yours in manifest and in MainActivity class. 1. Can I send rating parameters to Google server using Google places API’s? 2. I have to pay Google for Google places & Google map services? I have 2 questions relating this.Can you please help me? 1) I have added Rail Stations is string.xml .But no stations are showing in map. I download projects from this site only and put my access keys at their perspective position but i am not able to see map pls can u tell me reason? Sir how do i get only the business places or malls,shops and so on? Thank you so much…it really helped me. Searched for many tutorials but ultimately this worked…. Thanks for your tutorial. Please help me to solve my issue. When i click on find button nothing is happened. Request denied message is appearing in my logcat.I added browser key and android key but i didn’t get nearby locations. Thanks for the tutorial. Please help me to solve my issue. I am getting current location but unable to get nearby locations. It gives me Request Denied error. could you please help me because search option is not working . But there is a problem for me, when my device disconnect any of the internet or gps, after i click on the Find button, it will appear an error that say “Unfortunately, your apps are stopped”, then after clicking OK will go exit. May I know is that any way to do like a pop out window will appear and tell to “Please connect to an internet and GPS” instead of this error. Thank you so much for your tutorial!! i open it in emulator but says :google play service is not supported in you device . Sir,since the add event has been removed from the google place API since 2015, so how i going to do so?For example, an add extra info(event) about the discount/sale of the store/shop/cafe/restaurants. i want change ATM to gas station.how i can do that?? brwoser key is android api key??? how can i obtain a browser key?? I have a question, this example works perfect. When I insert the map at a Fragment (not v4) I have had many problems in my application I have three tabs and one of them will be the Map. Could you help me guiding me as I embed one FragmentActivity into a Tab using the commit () the Fragment or perhaps an example Maps on Fragments? Thank you very much Mr.
how i can i search for a specific place not a list of google supported places?? can any 1 help me???? The data that is received from google places API which you have parsed from Json into a list object , can you save that data in your personal database to fetch the details of the place later from your own database ? thank you for the tutorial.app runs perfectly but i am unable to find any places.it always shows map.what should i do. please help me on that issue. Recently google has changed it’s procedure for creating the API key. And in the documentation there is nothing about how to create API key. So please can you tell us how to create API key, because I tried with API key, server key and browser key. But no one key is working. I have downloaded the app and tried it. I installs well but when select a place it does not do anything. At first i thought it was the onclick listner intent. i tried the above code but when i select the options from the spinner section markers(places like bank or hospital…) are not updating..
For people not getting any markers when pressing the FIND button,that is because the latitude’s & longitude’s value is still 0.0 & 0.0 respectively. What you need to do is to improvise the code so that it stores your current location explicitly. Then pressing the Find button will display the markers. I have a got a problem.Everything is working fine but except one thing – Place Api. It’s not getting enabled and I am not able to solve this problem. Hope you will help me. and I really appreciate you for this code. and Thanks in advance ! Thank you so much for your tutorial. I am able to get my current location, but I am not able to see any markers and even after selecting ATM or airport from menu and clicking on “Find” button, no markers shows up. 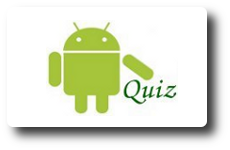 I am using correct Android key and Browser key. Please help. Sir i need some help regarding google map. I have a current location now i want to list all nearest location which is between my current location and around 50/100 kilometers using S.E/N.W. I am stuck that point from last 2 weeks. Any help would be really appreciate. Can someone please tell me what I must LOG to show the results ? I need to know if I’m receiving the data. not getting any response while I am changing the data items (like ATM, Airport and all) from spinner. Application just showing the Map. 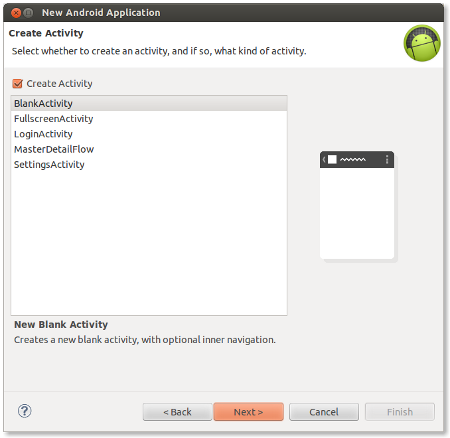 So can you please help me, I am running this same code on Android Studio. 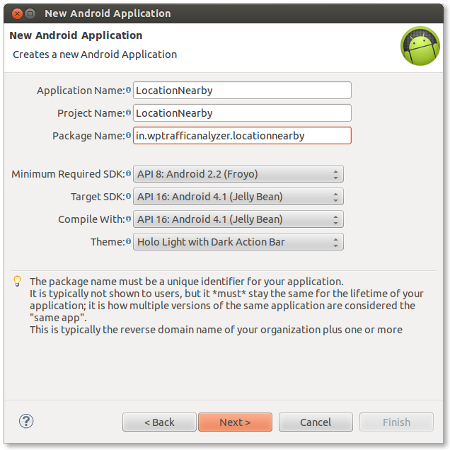 sir, i m currently working on a google Map based application using android studio. In this application i want share some information within a radius, that radius are set by me.. sir i have no any idea how to do it.. plz help or guide me..
i followed all instructions as you described abovve i am not getting any error or exception,but when i click on the find button nothing is happening,plese solve this problem..
Everything is working fine but map isn’t showing when activity is launched. Sir, I’m facing an error..
the error is in this line. how can i over come it ? ?